When it comes to email marketing, companies do their best to make sure their newsletters are delivered, opened and read by as many recipients as possible. They would think of new exciting subject lines and research the best times to send emails. Yet, despite all the efforts, there is one thing that might be detrimental to your email marketing. That is — using a noreply email address for sending emails. What is a noreply address? A noreply is an email address that uses the format [email protected]. Normally, it’s not monitored and prevents customers from sending a response. In the worst cases, an email sent to a no-reply address does not only go unanswered but also bounces off. While a noreply email is hurtful for company’s marketing efforts and sheds a bad light on its reputation, some companies still use it for their email newsletters. Why do companies still use a noreply email address? If you put significant effort into building your email list, soon enough it will grow to thousands if not hundreds of thousands of subscribers. While bulk emailing such a large list opens up great business opportunities, at the same time, it can have its drawbacks, too. For instance, from our experience, about 0.2% of recipients are usually out of office and set up an autoresponder to let people know they can’t reply to emails at the moment. If you have 1,000 subscribers, every time you bulk email the list, you would get 2 out-of-office autoresponses. At this point, it’s not a big deal to simply delete these two emails. But if the list grows to 10,000, the number of these emails grows correspondingly, to 20. Do the simple math, and you’ll get 200 autoresponses with a 100,000-subscriber list. In order to avoid dealing with these automated responses, some companies use a [email protected] email address. However, this is a very bad strategy. Here’s why. Some users set up rules that would delete all emails coming from noreply addresses. There are email service providers that do this automatically, too. People might want to reply to your bulk email for a number of reason. Sometimes, they just might want to update their information with you. For instance, a person might no longer work in the company or their email address might have changed. When using a noreply email address, you don’t give them an opportunity to reach you. This builds up frustration, and instead of trying to connect with you via email, they just hit the Spam button next time they receive your newsletter or email. Keeping your email list up-to-date helps you increase your email deliverability and avoid being sent to the email junkyard aka the spam folder. That’s why it’s important to provide your recipients with a real email address that they can use to contact you. To increase email deliverability, it makes sense to ask your subscribers to whitelist your email address. In addition to that, some subscribers might want to do it themselves in order not to miss your emails. However, it might cause issues if the email address starts with [email protected]… as some email service providers simply don’t allow whitelisting noreply email addresses. While email is supposed to be a two way road of communication, no-reply addresses turn it into a one-way broadcast. By using a no-reply email address, you don’t talk to your customers, you talk at them, giving them no chance to communicate back. Basically, you demonstrate that you are not too concerned about what your audience has to say. All you care about it transmitting your message, not hearing their opinion. Potentially, this is hurtful for your company’s image in the eyes of your customers. Most people read their email on mobile devices. That’s why they see less information in their inbox: only the sender’s email and a part of the email subject line. While a noreply email address is perceived from a negative side, it takes up a significant part of this space and decreases conversions. It happens to the best of us: from time to time, your subscribers might want to unsubscribe from receiving your newsletters. Some of them will scroll down to the bottom of the email in search for the Unsubscribe link, while others will hit “Reply” and ask you to remove them from the list. Using a noreply email address deprives them of the opportunity to let you know they no longer want to hear from you. Therefore, next time they receive a noreply email from you, they’ll simply hit the Spam button without further ado. This might hurt your email deliverability to the rest of the subscribers’ list as email service providers might mark you as an untrustworthy sender. As an entrepreneur or marketer, listening to your customers’ feedback is a backbone of your business. To make right business decisions, it’s important to hear what your customers have to say, whenever they want to say it. A noreply email address shuts this communication channel. If you send out a newsletter from a noreply address and give your customers no chance to talk back to you, how will you know if they found it helpful? Last but not least, bulk emailing from a noreply address might lead to law violation. As spam grows to become a bigger issue, some countries have put regulations in place to protect their citizens from unwanted or spammy emails. While some countries like the US operate under the CAN-SPAM Act, it still implies that your subscribers can opt-out at any time they want. This includes providing them with a valid email address they can use to contact you. Instead of using a noreply address, it’s a good idea to use an email address of a real person. For instance, sending bulk emails from a company’s CEO address increases chances of a dialogue. DigitalMarketer, for once, sent all emails from their founder’s Ryan Deiss’ address. Another idea is to use a common email address like [email protected]. If you get a lot of out of office emails, try to identify what common words they contain. It can be things like “automated response” or something similar. For every phrase like that, you can set up a filter that will automatically delete such emails. However, it’s important to filter out real emails, as you might inadvertently delete a real client’s request. Another idea is to use the [email protected] address. This way, your support team can handle all the replies right away. You don’t necessarily have to send bulk emails from this email address. Instead, you can set it as a reply-to address so that it’s used automatically every time a user wants to reply to your emails. 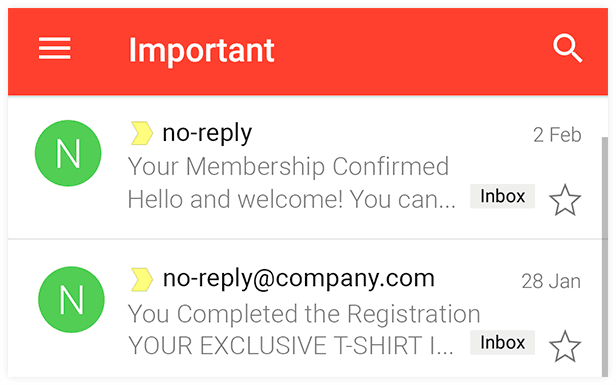 Sending bulk emails from a noreply email address is a quick but bad solution. In the long run, it will upset your customers, and decrease email deliverability and open rate. Instead, in a matter of minutes, you can set up automatic filters for out of office emails and not spend too much time handling them. At the same time, your customers will see that you are open to communication. This will improve your credibility and allow them to provide valuable feedback.